Visual Website Optimizer is the all-in-one platform that helps you conduct visitor research, build an optimization roadmap, and run continuous experimentation. View ongoing experiments and variations in the call log and track even more goals by sending conversions with your call data using triggers. Anything defined as a conversion in CTM can be sent to VWO to update test goals. Once VWO has been linked, you can view reports with VWO campaign and variation data in your Activity Reports page. The VWO integration is not available to all plans. Click here to check or update your CTM plan. 1) Install the CTM tracking code on your website. 2) Navigate to Settings → Integrations → VWO. 3) If you wish to send conversion events to VWO for your inbound calls, click Send conversion events to enable the integration. 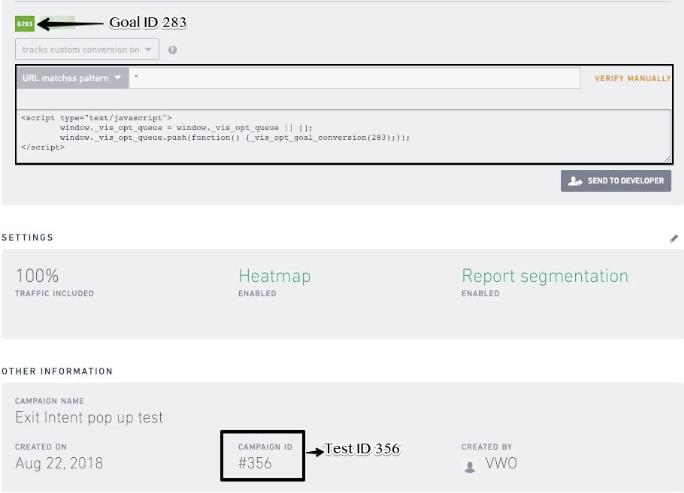 4) Inside VWO, you need to set up the Test with one of the goal as “Track Custom Conversion On” goal and CTM will start tracking which experiment and variation each of your visitors are participating in. You do not need to install the custom conversion goal code snippet for CTM to work. 5) On the integration page in CTM, click on “Go To Triggers” (or navigate to Calls → Triggers), then click to create a new trigger. 6) Select when you would like the trigger to run and specify any rules you would like to use. 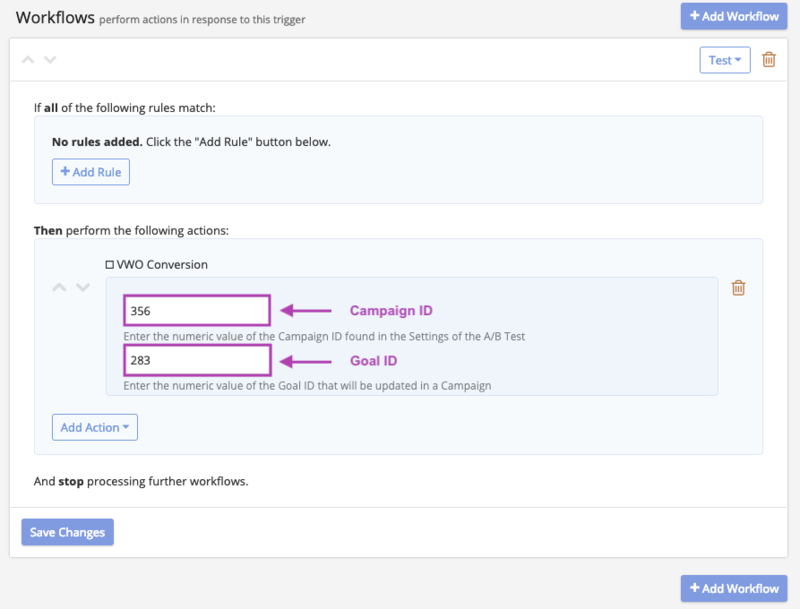 7) Click Add Action and select VWO Conversion. 8) Enter the Goal ID (of custom conversion goal) and the Campaign ID to start sending conversion events.